Obituary for Ernest P. "Bub" SNODDERLY | Andrew K. Coffman Funeral Home, Inc.
Mr. Ernest Paul “Bub” Snodderly, Jr., 91, of Hagerstown, died early Wednesday morning, January 16, 2019, at his daughter’s residence in Hagerstown. He was the husband of the late Helen Virginia “Sis” Condon Snodderly, who preceded him in death on June 18, 1997. Born October 18, 1927, in Hagerstown, he was a son of the late Ernest Paul, Sr., and Margaret Oda Mae Frush. 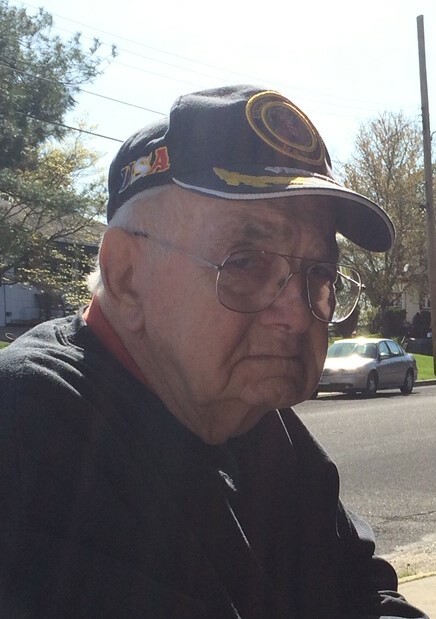 He was a veteran of World War II, honorably serving with the United States Navy. Mr. Snodderly was employed with Eastalco Alcoa Works, Adamstown until 1986, at Blaine Window Hardware Company, Inc., Hagerstown, finally retiring in 1994. He continued being active volunteering with the Potomac Center, Hagerstown where recently he received an award for his outstanding volunteerism. He was a member of American Legion, Dixon-Troxell Post 211, Funkstown; and The Redmen, Conococheague Tribe #48, Williamsport. Surviving are his children Lynda Darlene Sheppard and Randy E. P. Snodderly, both of Hagerstown; his grandchildren, Kayla and Andrew Snodderly, Sarah Scott Bradshaw and Hilary Scott, and great grandchildren, Tramel, Charjzon, Charleigha, Chloe and Jayceon; as well as his brother, Leonard Snodderly of Hagerstown. Besides his wife and parents, Mr. Snodderly was preceded in death by sisters, Thelma Jones, Cleo Burger, and Gladys Biser. The family will receive friends at Andrew K. Coffman Funeral Home, 40 East Antietam Street, Hagerstown, on Monday evening, January 21, from 6:00 to 8:00 PM. A graveside service with military honors provided by Joint Veterans Council – Marine Corp League of Hagerstown, will be held Tuesday, January 22, at 2:00 PM, in Rest Haven Cemetery, 1601 Pennsylvania Avenue, Hagerstown. Hospice Chaplain, Rev. Duane R. Musgrove, will officiate. Family and friends attending should enter the “lower entrance” by the lake. A procession to the grave will occur just prior to 2:00 PM. The omission of flowers is requested. Memorial contributions may be made in Mr. Snodderly’s name to Hospice of Washington County, 747 Northern Avenue, Hagerstown, Maryland 21742.